The NFL is kicking off their Monday night series in style, featuring not one but two games to satisfy the cravings of all fans. 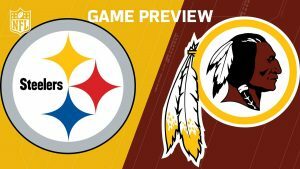 The first game of the night will be between two of the wild card teams from last season, the Pittsburg Steelers and the Washington Redskins, the kickoff is set at 7:10pm ET and can be watched on ESPN. The Steelers come in as favorites in this match, the line opened with Pittsburg as a 2.5 favorite and quickly moved to a 3-point favorite, so early indications are the money is on the Steelers. As for the total it opened up at 51 and is now at 50 but I expect this number will go up again before the game starts. So if you are thinking about betting the over now is the time. The Steelers have been plagued by injuries and suspensions that could end up hurting their chances in game one, case in point Le’Veon Bell one of the top backs in the league will miss the game due a suspension for a failed drug test, and wide receiver Martavis Bryant who is suspended for the season. Even without them the Pittsburg offensive line is pretty strong with veteran Roethlisberger who has averaged 318.9 yards per game the last couple of seasons and wide receivers Antonio Brown who achieved 264 catches during the last two season and with wide receivers Sammie Coates and Markus Wheaton the team has a fair chance of winning. The problem with the Steelers remains with their defensive line, even though vast improvements have been made under defensive coordinator Keith Butler their secondary remains questionable and is certainly a concern. The Redskins can brag about having one of the fieriest offenses in the NFC, starting with their young quarterback Kirk Cousins who has a 69.8% completion rate, and tight end Jordan Reed who last season caught 87 passes for a total of 952 yards and 11 touchdowns, completing the start lineup we have DeSean Jackson, Pierre Garcon and Jamison Crowder and if Josh Doctson comes off the disabled list ( he is currently recovering from an Achilles tendon injury) then they will have one of the best receiving teams in the NFL. The issue with Washington is they have trouble running the ball, if they can base their game on throws then they will become a huge problem for the Steelers defense. As far as their defensive line, the Redskins were already pretty good, but this year they have added cornerback Josh Norman to their roster and this could give them enough of an edge to become a threat to a lot of teams, their weak spot however, remains in their running defense. Make sure to keep up with the movement on this NFL gambling game’s line at AceSportsbook.com and place your bets when the line is just right.